Underbed storage boxes are one of the smartest ways to take advantage of unused spaced. 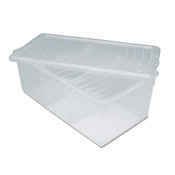 At JustPlasticBoxes.com, you’ll find underbed storage with wheels as well as under bed storage bins that glide along soft surfaces. Each of these underbed storage containers differs slightly. Whether you’re looking for a more heavy duty plastic underbed storage for shoes and sweaters or need a small under bed storage bin, you’ll find them here. Underbed storage containers don’t just have to be limited to the bed. Have a small shelf where only under bed storage boxes can fit? 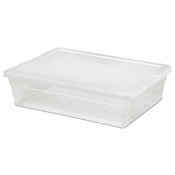 Have heavy items that would be too hard to carry in anything bigger than these underbed storage boxes? You’ll find how helpful these underbed storage containers truly are. Each of these underbed storage boxes has different features. You might like the long under bed storage bins with folding lids that allow you to access items on either side without having to pull out or remove the entire lid. 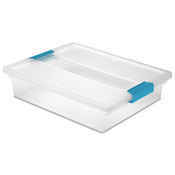 Some of these underbed storage boxes also have latches to secure the lid which are easy to open. The underbed storage with wheels works well for rolling on hard wood floors or other hard surfaces where you have a long low area. While you may prefer an underbed storage with wheels but don’t have the added height, try the Iris stor-n-glide under bed storage bins which feature simple discs that allow the underbed storage bin to glide along a smooth surface. An underbed storage box with lid can easily be stacked in long narrow areas and work well if you have longer items like gift wrap you need to store. An underbed gift wrap organizer is a must in any Christmas organizing system. 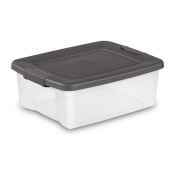 What do you plan to use underbed storage containers for? Under bed storage boxes for clothes and clothing are great for out-of-season items like sweaters and boots that you don’t have the room to fit into a storage space. For the shoe lovers with small closets, these underbed storage boxes can also be handy for tucking away your favorite pairs that you don’t use every day but need to keep close by. You can also use underbed plastic storage containers for toys in kids rooms. Plastic underbed storage is a smart move in a college dorm room or camp.